Enjoy your child’s birthday party! Give your child the most exciting birthday party ever! 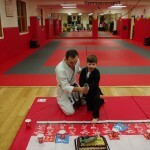 At KI Martial Arts each Birthday Party is structured for Fun! It is an educational and energetic party. 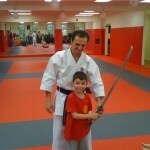 Every activity is organized and handled by an experienced and enthusiastic instructor. At your KI Martial Arts Karate Party, the children will never run wild. This birthday party is filled with great games and drills. The kids will have FUN while they learn their first Karate moves. Mom, Dad and the entire family can join in the FUN in the Parent’s Team – Children’s Team Challenge! NO EXPERIENCE REQUIRED TO PARTICIPATE! 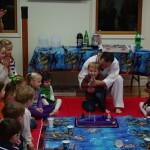 For a memorable occasion Our Birthday Parties are fast paced, fun filled and full of surprises. Kids love our birthday parties because they get to learn something COOL and have a party! 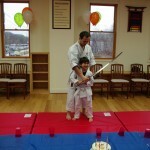 Your party includes a Very Special Group Karate Lesson full of Martial Arts games and activities, with the Grand Finale of your child cutting the cake with a REAL SAMURAI SWORD. Let us make this the best birthday party! As with all of our winning programs, all parents are welcome and encouraged to attend and participate! 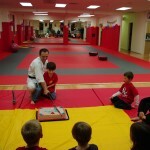 Karate Birthday Party! The Best Birthday EVER! CONGRATULATIONS on Your KI BIRTHDAY!